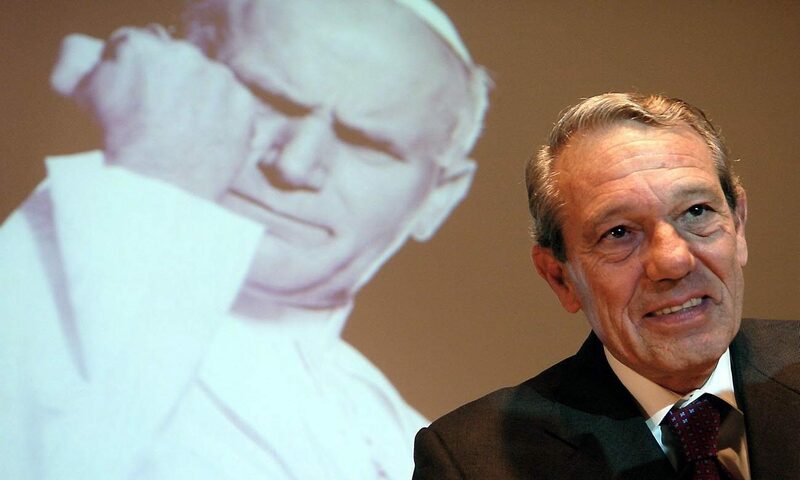 VATICAN CITY (CNS) — Joaquin Navarro-Valls, who spent 22 years as director of the Vatican press office, died at home in Rome July 5 at age 80 following a battle with pancreatic cancer. The current director of the Vatican press office, Greg Burke, announced his death in a tweet. “Navarro always remained a friend for me, an example of discreet spiritual life, true and profound, fully integrated in his work, a model of dedication at the service of the pope and the church, a master of communications, although for me — as I have already said, but repeat — inimitable,” Father Lombardi said in an editorial published July 6 on Vatican Radio. Born in Cartagena, Spain, Nov. 16, 1936, Navarro-Valls joined Opus Dei after meeting St. Josemaria Escriva. He studied internal medicine and psychiatry before obtaining degrees in journalism and communications sciences. He moved to Rome in 1970, where he collaborated with the Opus Dei founder. He became a correspondent for the Spanish newspaper ABC and was elected twice as president of the Rome-based Foreign Press Association in Italy before becoming the first lay journalist to become director of the Vatican Press Office when he was appointed by St. John Paul II in 1984. After leaving his post at the Vatican, he served as president of the advisory board of the Opus Dei-affiliated Campus Biomedical University in Rome until his death. An author of books on the family and fluent in several languages, Navarro-Valls often provided colorful, picturesque details concerning St. John Paul’s activities and daily life. He also acted many times as an adviser to the pope on the media impact of papal decisions. He traveled with St. John Paul on almost all his apostolic journeys and became a well-recognized figure, especially after the pope became ill in 2004. He regularly held press conferences to relay news to the world of the pope’s deteriorating condition. In 1992, Navarro-Valls overhauled the press office with a $2 million technological face-lift along with much-needed, modernized facilities. He also revolutionized the distribution of material by making archives, documents and statistics concerning the pope’s activity available online. According to the Opus Dei website, a wake was to be held at Rome’s Basilica of St. Eugene July 6. His funeral was to be presided by Msgr. Mariano Fazio, vicar general of Opus Dei, July 7.